Xboxes in Australia just got slightly more awesome. The ID@Xbox bundle, titled the Xbox One Independent Developers Pack, contains download keys for 5 full games and extra bonus content for 2 free-to-play games. Hand of Fate – This is a great action/card building strategy game. See our review on the PS4 version here. #IDARB – A couch-co op game focusing on multiplayer madness. The Jackbox Party Pack – The team behind YOU DON’T KNOW JACK presents FIVE guffaw-inducing party games. It features a trivia game, fact finding game, mad-libs type game, and others designed to make your parties awesome. Never Alone – A lovely side-scrolling storytelling game that bridges documentary and gameplay in a lovely story about a little girl and a fox, and their journey together. Threes! – The popular number matching game that got it’s fame from the mobile gaming community. Warframe (free-to-play) – Go solo or band together in squads of 4 to complete co-op based raids and locate ancient artefacts to help customize and upgrade your Warframe and weapons. Download this free-to-play game plus 170 platinum in game currency. SMITE (free-to-play) – A new take on the MOBA genre; rather than observing from above the action, the game’s third person perspective puts players into the thick of combat. Beta access to this game included, plus a 400 Gem Pack. Additional Contents: 2 AA Batteries, Power Supply, AC Power Cord. The price for this bundle runs AU$499.00 incl. GST, which is $380.61 in USD (at the time of this post via a google currency translator). 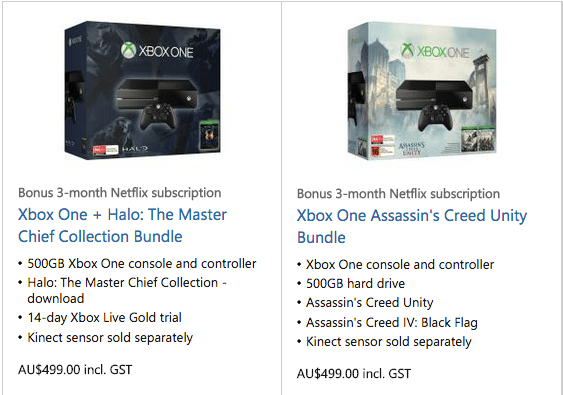 This is the same price as the standard Halo MCC Bundled Xbox One, and Assassins Creed Bundle as well. So you’ve got the option to go with a AAA game (and a bundled 3-month Netflix code), or get multiple great indie games to start off your Xbox One collection with. Again, this is Australian only, but with E3 roughly two weeks away, it’s very possible the US and other countries may see similar bundles helping promote the indies via ID@Xbox.